Moms. They are literally the beginning of every person’s story. Since every mom is different, every start, every first line of every story, is different. My story starts with fearlessness. This photo, circa 1976? ’77? taken near a cabin in Big Bear, California, gives you a good indication of how my mom started my story. She probably would deny it now, but I know otherwise–my mom is fearless. Or rather, she may have her fears, but she charges through them and without that core of fearlessness, I would not be who I am today and my daughter would not be who she is today, and knowing my daughter, I feel confident that whether she has sons, daughters, or both, they will not be whomever they will be without the fearlessness that my Mom has written into our stories by her own example. I have seen my mom hop out of a ginormous motorhome on a back parking lot in Las Vegas, fearlessly stopping a pretty fair amount of traffic (hungry people on their way to gambling and brunch–not a chipper crowd, folks!) and directing my dad as he maneuvered out of an impossibly tight space. 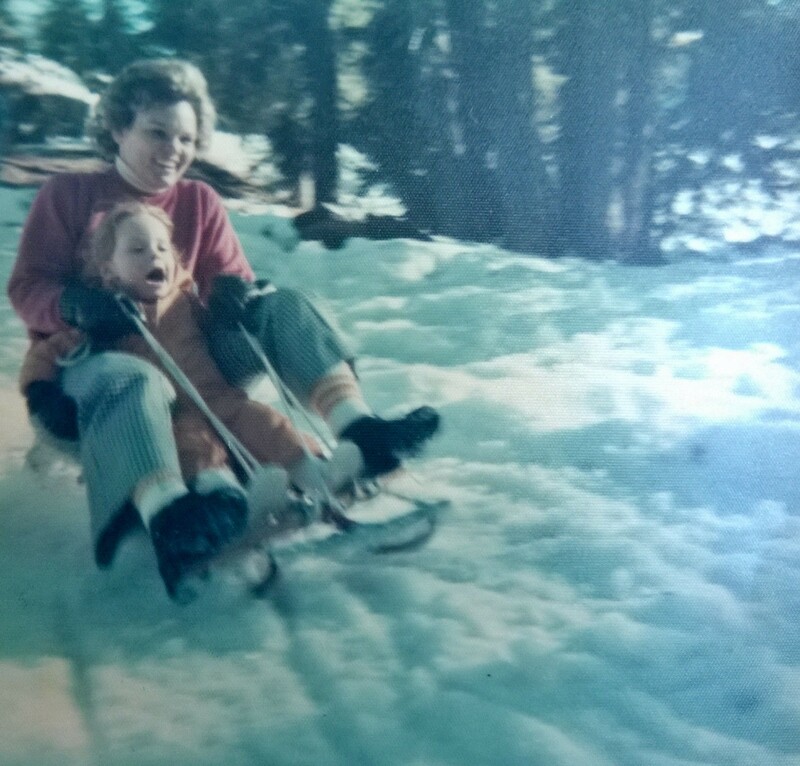 I have seen my mom fly down ski runs faster than greased lightning–she doesn’t believe in turns because they slow you down. When the rest of my family water skiied with a focus on slalom turns, it was my mom who centered herself on the wake, bent her knees in a tuck, gripped the handle with one hand and with the other, waved a challenge at the driver, daring us to open up the boat to full throttle. More importantly, as our business has imploded, exploded, and shot shrapnel in every direction, I have seen my mom show up at her desk the next morning, finding something to do. Whether she felt it or not, she was still fearless. At this point in a long, exhausting battle, after more than a few kicks from the jackass that life can be to us all, my mom would tell you she’s not fearless anymore. She would tell you that the opposite is actually true, but I know it’s a lie. Her words say one thing, but her actions say quite another entirely. In this world of quitters, complainers, excusers, and generally half-assery, my mom shows up, in spite of what she may be feeling. And that’s true fearlessness. I thank Mom for ordering a Spiced Pumpkin Cake with Cinnamon Cream Cheese Frosting and Caramelized Pumpkin Seeds with Sea Salt for her dinner with friends tonight not just for ordering a cake and paying me (mostly) with 8 pounds of butter (which–honestly–was AWESOME! ), but because it has given me the perfect excuse to focus not on my story, but to reach backward and remind her about the start of her story, which was the start of my story, and the start of my daughter’s story. To remind her that she is fearless. She is the fearless heart of a fine tradition of women. There will not be a picture of a cake today because the picture at the top of the post is the only one necessary–that picture says it all. How could I possibly thank you enough for that impossibly wonderful commentary? I am the recipient of the most valuable and awesomely beautiful prize. One that is above all others–the love of my child. Thank you. And thank God, for this little pink baby with the strawberry hair who has become the finest woman I will ever know. Alright, now you’re going to make *me* cry! I love you, Mom! My dear Kris, your lovely words about your Mom were heartwarming and I certainly agree. I also appreciated the great and accurate description of Avery — a truly outstanding and beautiful girl…You spoke of her being fearless which befits a line of fearless women, but you need to show the beginning of her fearlessness at age 3! That’s a pretty big dog for a 3-year old to befriend…but she did and they did become friends! Picture sent to you by e-mail. Love you Kris.